Two first bands (first band is the one nearest the end of the resistor) indicates the value, the third indicates the multiplier and the fourth indicates tolerance. has a value of 47 kΩ with tolerance +- 2%. Three first bands (first band is the one nearest the end of the resistor) indicates the value, the fourth indicates the multiplier and the fifth indicates tolerance. has a value of 249 kΩ with tolerance +- 1%. Engineering ToolBox, (2010). Resistors - Color Codes Calculator. 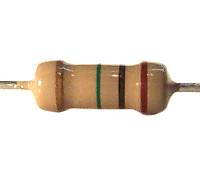 [online] Available at: https://www.engineeringtoolbox.com/electrical-resistor-colour-code-value-tolerance-d_1655.html [Accessed Day Mo. Year].